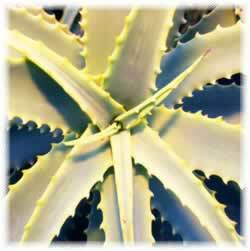 Preparation Methods & Dosage :The freshest aloe is of course, from your own plant. 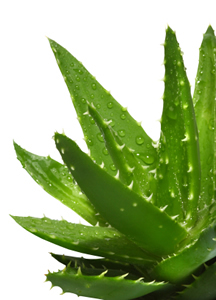 Apply aloe gel directly to skin for cooling relief to dry, itchy skin, minor burns and rashes. Commercial aloe skin care products (containing stabilized aloe) rarely, if ever, pack the therapeutic punch of fresh aloe because they no longer contain any tannins, and are mostly adulterated with alcohol. 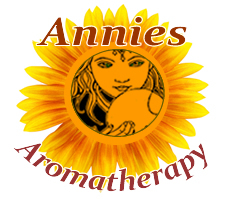 You can also incorporate aloe in homemade lotions, and use it as a carrier for essential oils. Add a few drops of Chamomile and/or Lavender oil for burns and scalds. Ayurvedic Medicine Called kumari meaning virgin, aloe is used internally in Ayurveda to restore youthful vitality and as a female tonic. 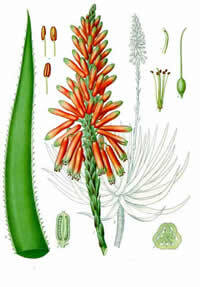 Aloe looks like a cactus, but is actually a member of the lily family, a tender tropical, native to Africa. Plant Class: Tender evergreen perennial. Species very greatly in size. Distribution: Native to southern Africa, Arabia, and the Cape Verda Islands. Can be grown as a garden plant in warm climates, or a sheltered house plant. You can grow aloe as a houseplant, in fact is it wise to do so. Not only does an aloe plant provide quick relief from a burn or scald, the potted plants have been shown to remove formaldehyde from tainted indoor air.